Class Description: Posture and Alignment: Class Focus explores breath linked to asana poses, and present moment awareness. Mindful alignment supports healthy joint posture in every yoga pose. Core stability and education rooted in one’s own inner wisdom is the key to reaching ideal posture. 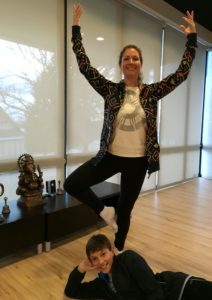 Megan’s personal goal is to share yoga with students of all ages, abilities, and inspiration. She completed the 200 hour registered yoga teacher training at We are Yoga, Salt Lake City, in 2016. She has also taught Kids Yoga since 2012, completing training with one of her lovely mentors, Brandi Allen. Megan graduated from the University of Connecticut Physical Therapy Program in 1995. She has diverse clinical experience in a variety of Acute Care Rehabilitation and Orthopedic settings. She brings a compassionate perspective as a Physical Therapist to share the beautiful path of yoga. Ski coaching is also a passion of hers. She currently coaches for Rowmark Ski Academy at Park City. Whether recovering fully from an injury or pushing one’s goals toward a higher level of wellness, Megan is committed to each student’s personal growth and exploration of their yoga practice.